Since it took me 10 minutes to make a bowl of this flash-pickled condiment, I thought the writing of this post was going to take 30 minutes at the most. I would snap a few pictures of the cucumber relish, post them on here, write a couple of paragraphs, and move on with my life. Boy, was I wrong. Little did I know that the whole “30 minutes at the most” thing would turn into hours of research on the etymology of the Sanskrit name अचार (achār, whence the Thai “ajat,” “achat,” or “ajad” (อาจาด) comes (most likely via Malay and/or Indonesian). Knowing that the name of this condiment and the condiment itself have been adopted into the Thai language and cuisine respectively (either by way of our southerly neighbors or foreigners living amongst us) wasn’t enough. I had to find out what the Sanskrit means literally, whether the origin can be traced back to languages outside the Indo-European family, how it might be related to the Persian and Urdu آچار (âčâr), etc. Six hours later, I was lying face down on the floor, spread-eagle, surrounded by 5-6 dictionaries (all proven useless), mentally spent, and still as unenlightened as I was when the research began. Other than the fact that the word has been used within the Indo-Aryan and Indo-Iranian sub-groups of the Indo-European family as a generic name for pickle, I didn’t get anything else out of all that reading. While achar/âčâr (Sanskrit, Hindi, Urdu, Pashto, Indonesian, Persian, etc. ), atchara/atsara (Tagalog), and acar (Malay) usually refer to various kinds of pickle, once the concept has entered the Thai cuisine, a new name variant “achat/ajat/ajad (อาจาด)” emerged, and the form of the condiment as a quick-pickled cucumber relish became fixed. As you can see, it bears almost no resemblance to acharaccording to the South Asian tradition. To make ajat syrup, boil together one part sugar, one part white vinegar, ¼ part water just until the sugar dissolves. Add salt to taste. The syrup can be made ahead of time and stored in a glass jar in the refrigerator. 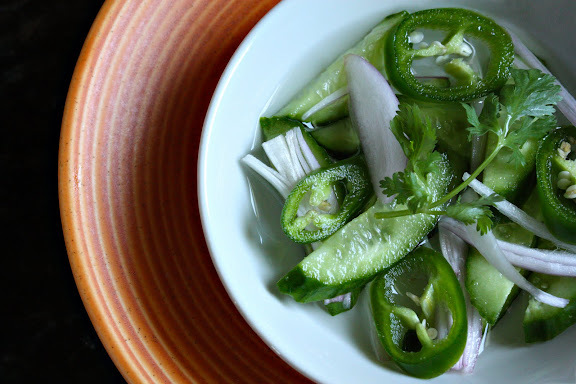 To make ajat, simply slice up some cucumbers, shallots (or red onions), and fresh jalapeno peppers. Place everything in a bowl and pour the prepared syrup over the vegetables just until they’re barely covered. You want to do this just before serving as the acidity of the syrup will soften and discolor the vegetables. Ajad, ajat, achat is usually served at room temperature. Garnish with cilantro leaves, if desired. what a green color, Looks delicious. Simply awesome. Love, love, love ajat. Hate it when they serve it all gloopy at Thai restaurants, though. We also add crushed, fresh roasted peanuts, chopped cilantro and a splash of fish sauce. I like it with fish cakes, spring rolls and massaman curry too. I’m surely making this with any Thai meal I make next. Cucumber, onions and chillies are a common combination in Indian salads on side with Dal or vegetables. And the syrup, I don’t know its very Indian but my mom makes something similar with Raw mangoes (or lemons) and makes a syrup with vinegar, water, Jaggery, chilly and salt. Thank you for posting.I’m so glad I found u through Twitter . In regards to the ajat syrup, is it equal amounts of sugar and white vinegar by volume? Also, will this syrup work well with daikon and carrot? Anon – Yep. By volume. I figure it should work with carrots and daikon as well. Might take a bit longer to marinate. I’m not sure if this is a good place to ask, but if you have time could you possibly answer some questions? Firstly, how would you eat a relish like this? Is it like a salad? Would you pick out the vegetables and leave the liquid behind? I’ve seen recipes that are for dipping sauces that include shallot slices, cucumber, chili and other chunky bits. How would one eat those? Is the sauce for dipping or is the name misleading? Would you eat the chunky bits? I’m a bit confused by all the types of thai condiments, ha ha! Some for dipping, some for drissling over your food, and some like the ones I asked about that I don’t understand what you do with. Another thing I’ve been wondering about is the vegetables you eat with things like Laab. Is it just plain, raw cabbage, beens and so on? Do you eat it with or in between mouthfuls of the laab? I’ve never seen vegetables eaten this way before! Especially not the basil, I’ve never seen herbs used in the manner of salad before! Thank you so much beforehand, and thank you again for this magnificent site! Anon – Thanks for the kind words. Yes, the way most people eat this relish is to pick out the chunky bits and leave behind the liquid like you say. At least, that’s how I do it. I guess it’s kind of like pickle. You eat the cucumber slices, but you don’t slurp the pickle juice or dip anything in it. As for the vegetables that come with some Thai dishes such as Laab or Pad Thai (read my Pad Thai series where I talk about some vegetables that are served with Pad Thai), you got it exactly right: those are for you to eat between bites of whatever dish they come with. They serve as a palate cleanser and something to balance out the spiciness or grease. Given the Hindi term chaat ‘http://en.wikipedia.org/wiki/Chaat “derives from Hindi cāṭ चाट (tasting, a delicacy), from cāṭnā चाटना (to lick), from Prakrit caṭṭei चट्टेइ (to devour with relish, eat noisily).” – any chance that Hindi-speakers in Malaysia/southern Thailand created a deliberate portmanteau/blended word between ‘acar’ and ‘chaat’? A form of pun, if you will? Interesting. Definitely not entirely inconceivable, but the lack of similar foreign portmanteaux that have entered the Thai vernacular makes me hesitant to see this as a possibility. Do you have any recommendations for white vinegar? The only one I’ve experienced is Heinz, which is awfully harsh. I keep it on hand for cleaning but never use it for cooking. Is the sugar and water enough to mellow it? I generally love anything tart and have at least 6 or 7 vinegars at all times. The sugar and water help a bit. You might prefer apple cider vinegar in this. It’s the only thing other than distilled white vinegar that I find palatable in this application, and it should be a little less harsh. Looks and sounds delicious. Interesting to note that Hungary has a salad which is almost IDENTICAL to this one. The only difference is that shallots and bell peppers are omitted, with sliced raw white onion and a dash of paprika in their place. Love the site Leela, keep up the fantastic work! Great recipe. Easy enough and tastes good. I like it. I came here for this recipe, but I really enjoy your linguistic lessons, too. ruthie – Slavic languages are in the same Indo-European family as Sanskrit. Any cognates — if these indeed are cognates — wouldn’t be surprising. I came across this recipe after looking at some of your other recipes. I have to say this is exactly what I was looking for. I never knew the ajat was so simple to make. It turns out with the perfect balance of sweet and tart. I usually wait until the last minute to make this and so to cool it I will forgo the water and just mix in a little bit of ice to cool it quickly. BTW anyone looking for a peanut sauce Shesimmers’ recipe is the best I have found.